The Independent reports that a proposed supergrid could supply Europe with carbon free electricity primarily from wind power. The 5,000-mile electrical grid, stretching from Siberia to Morocco and Egypt to Iceland, would slash Europe's CO2 emissions by a quarter, scientists say. The scheme would make the use of renewable energy, particularly wind power, so reliable and cheap that it would replace fossil fuels on an unprecedented scale, serving 1.1 billion people in 50 countries. Europe's 1.25bn tons of annual CO2 output from electricity generation would be wiped out. High-voltage direct current (HVDC) lines, up to 100 times as long as the alternating current (AC) cables carried by the National Grid's pylons, would form the system's main arteries. HVDC lines are three times as efficient, making them cost effective over distances above 50 miles. Building the supergrid would require an investment of US$80bn (£40bn), plus the cost of the wind turbines – a fraction of the €1 trillion the EU expects to pay for a 20 per cent reduction of its carbon footprint by 2020. The average price of the electricity generated would be just 4.6 euro cents per kWh, competitive with today's rates, which are likely to rise as fossil fuels run out. . . .
"We have the technical abilities to build such a supergrid within three to five years," said Czisch, an energy systems expert at the University of Kassel in Germany. "We just need to commit to this big long-term strategy." The supergrid would draw power from massed turbines in a band of countries to Europe's south and east that have above average wind potential, feeding it to the industrialised centres of Europe. The scale would overcome the biggest obstacle to wind power – its unreliability. In smaller networks, such as Britain's National Grid, calm weather could cut production to zero. But the supergrid would cover a region so large that the wind would always be blowing somewhere. Gregor Czisch’s dissertation has rattled the energy world. Its main claim: Given the political will, Europe could within a few years meet 100 percent of its electricity needs from renewable energy sources, at no cost difference to today’s fossil fuel-based system.
. . . It would rely on some 70 percent wind energy, backed up by storage hydropower and biomass. "Some of the best wind capacities lie in deserted areas, such as in Siberia, Kazakhstan and the Sahara," Czisch told UPI. "And then you have the coastal region of Morocco, which has excellent wind capacities." Photovoltaics don’t play a major role in Czisch’s scenario because they are simply too expensive and because there are other, better sources available, including solar-thermal energy from southern Spain and the Sahara, for example. Foreword thinking or an absurd suggestion? I don't know that DC lines are three times as efficient as AC lines, but that is a small point. Czisch didn't comment on superconducting transmission, previous post, for some of the main lines, which are higher efficiency and more importantly can conduct up to 10 times the amount of power of today’s conventional copper cables of the same size. The use of superconducting cable would slow down the project, as the production capacity is not available, but the three to five year construction time estimated for the project is much too optimistic, as no doubt is the US$80bn price tag. But despite all these negative comments, I think it would be a great project that could be built within 20 years. Getting the political will is the main problem. They estimate that a high voltage DC line running from Morocco would have lost about 10% of power on the journey to Northern European countries like Germany and the UK. That is a long way, and considering how cheaply solar thermal (and according to this thesis, wind) could be generated in northern Africa and southern Europe. They also suggest adding in northern European wind farms into the network. 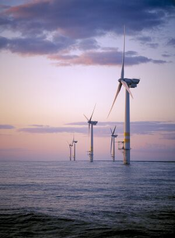 which is studying the possibility of linking a deeply offshore wind farm in the North Sea via HVDC to mainland Europe and the UK. As you say, the main problem is political. However, this is something the U.S. should find much easier to push through politically (perhaps with involvement from Canada and Mexico?) - three countries much easier than the 30 or so that these two projects would have to co-ordinate. I think there would be vulnerability of supply concerns. The EU has seen Russia play hardball with NG deliveries, and may well fear similar stunts might be pulled on electrical supply. Also the possibility of sabotage has to be considered. I hope something like this can occur, but the challenges are large. Fortunately small pieces could be constructed for regional needs first. So long as the scheme was just within the EU, security of supply should not be a problem, because a member state who turned off the tap would (a) suffer loss of power themselves and (b) fall foul of the wrath of the other member states, which would presumably be nasty for their economies. Russia may be more of a problem, but again, if this were a truly integrated grid, it would be hard for Russia to take away supplies from others' without also disrupting its own supply (its own wind farms would not amount to a stable generator), and it would also lose money. While Russia is flexing its muscles over Gas supplies, the current arrangement, as it knows, is symbiotic. Europe gives it lots of money, it gives them gas. Both would be set to lose if it is not available as a secure supplier. HVDC lines are three times as efficient, making them cost effective over distances above 50 miles. I really doubt the part about cost effectiveness at distances as short as 50 miles. If this were so, there would be many more HVDC lines in use. The high voltage, high power electronics needed to convert between AC and DC are quite expensive, making the use of HVDC lines economical only for long distances or for moderate distances under water. I really do like the idea, though I see the the HVDC line and the AC/DC converter stations as being highly inviting targets for terrorists. At what distance do they become cost effective? Do you have a source? "If this were so, there would be many more HVDC lines in use." You mean it's not possible that new technology has made them cost effective? "I really do like the idea, though I see the the HVDC line and the AC/DC converter stations as being highly inviting targets for terrorists." Hmmm. What about existing transformer stations and power lines? ALGIERS - An Algerian company is planning to build a power cable to Germany to export solar-generated electricity from the Sahara, a state-owned newspaper reported on Wednesday. I think Europe is going to treat this subject a lot more seriously than we are in the U.S. They don't have coal or gas reserves to fall back on, and nuclear is out of favor at the moment. Plus they tend to take global climate change a whole lot more seriously than we do in the U.S. In terms of solar, the approach is more along the lines of CSP - concentrating solar power. A plant has been built outside of Seville Spain that illustrates the concept. Cheaper than PV, but evidently only practical on a large scale and not something suitable for individual homeowners. The TREK-UK site has a Google Earth that shows the locations of a number of solar installations around the world. Some of the locations used to be only tentative - I had a few days off last summer, and I nosed around in Google Earth and found a number of them. These plants are large enough that they easily show up if you get in close enough (the pictures in Google Earth aren't always current, so plants that have been built might not always show up). Regular HVDC (not HVDC Light or HVDC Plus) is, everything else being equal, supposed to be competitive at distances of around 600 km. They are working on bringing the costs down of the converter technology. HVDC has large advantages with distributed resources as they do not need to be synchronized as they would with an AC grid. I just don't think tying 20% of your energy production to a single source that swings up and down so greatly is an efficient way to go. If we do go with such a high wind portfolio, utilities are going to need more peaker plants. It is called pumped hydro. France could be the `70-80% nuclear they are without it. As the article also mentions going from the Sahara to Iceland to Siberia does even out the wind resources. (1) Vary consumption. Perhaps you only charge plugins when power is plentiful. (2) Use some form of power storage. (3) Have the network cover enough climate zones that variability is reduced. An optimized solution would use each of these methods to some degree. This is the old-world half of Buckminster Fuller's proposal for a world power grid. Building it in pieces is clever, and probably politically necessary. If extended across the Bering Strait, solar power could power the world with no storage. I like it except for that I think they are overlooking a few small details. This project is to replace their current energy production capabilities, but by the time it is built (if that is) the demand will be far higher by all estimates. Secondly, what happens when the Moroccans and other African nations decide they want the electricity generated by THEIR wind? ...unless they are included from the get go in the consumption estimates. On that note then, watch out--the developing nations' electrical demand will grow a lot faster and unpredictably. I also think its rather an article of faith that "the wind always blows somewhere", but does it blow intensely enough in the grid area to meet the demand of the whole grid? It's not just dead still air that hurts productions--high winds, especially storms hurt it too. What about the energy cost of manufacturing and building these turbines...of maintaining them? In a lot of markets such as Japan and California, energy consumption has been essentially de-coupled from economic growth, so the assumption that energy use will increase hugely in Europe may not be valid - energy has been cheap, so essentially we don't use it very efficiently, there is lots of room for improvement. As for Morocco and North Africa needing all the energy they can produce, the wind resource is absolutely vast and you can allow almost any growth you like in their own consumption without affecting their ability to export capacity. It should not be forgotten either that North Africa is also excellently placed to harvest sunshine either through thermal or photovoltaic power. The potential there is many orders of magnitude greater than any conceivable use. In a way this supergrid is already being built: There are already a number of HVDC connections between Scandinavian countries. Germany is connected to Sweden with two HVDC cables, a cable between the Netherlands and Norway has just been completed, a cable between the Netherlands and the UK is in planning. A connection between the UK and France already exists. Just wanted to share this interesting energy calculation workbook I found online It is cool. It actually shows you how to measure the amount of energy that your car really needs!! (as opposed to how much gas it eats). It also shows you how to measure the difference of energy used at low speeds and high speeds, lets you calculate the engine’s energy efficiency, and how your car’s energy compares to other things like energy in your home. It also discusses wind and solar energy, vehicle to grid technology (V2G) as well as electric and hybrid cars. No, it is an expensive book. I think the good Electricity Supply Europe with Wind Power. check the link i have found.. it has a mini couse about wind power cost at home,,,and it has many info about wind turbines..i love this site..
Wind Turbines produce FREE power! It is environmentally safe to use. We have been using electricity our entire lives. We use it at home, at the office and at school. Everywhere we go, electricity plays a big role. This is perhaps one of the biggest businesses around today. But lately, electricity cost in on the rise. It’s becoming more and more expensive. You dread the day when your electricity bill arrives. You use energy saving lighting, lessen the utilization of your air conditioning. Watch less television but it seems it doesn’t make any difference to your electrical bill. Well, part of the reason is that utility companies are continuously increasing their electrical rates. Some even do it on a monthly basis. Is there any alternative to it? Yes, there is! In order to free you from this ordeal is by making good use of the resources around you, natural resources that is. The Wind, It is free and unless the good lord takes it away from us, then we can utilize it as long as we want. Why not use wind turbines to provide us electricity? Nowadays, people have been using wind mills to power their residential homes. Windmills are very economical. Of course, you have to spend for the materials which you can purchase for a reasonable cost. But you need to be patient though in searching for a cheap and efficient windmill as most companies are selling it a very high cost. Investing on wind power is generally a very good idea. It is reasonable to purchase an expensive wind turbine; the cost that will be incurred is basically the same as paying for your monthly electricity for 3 to 4 years. There are also some companies and online sites that sell cheap and very efficient wind turbines. Wind Power is the answer to one of our financial problems. Contents of the article you are very rich, very beautiful picture very interesting, I love it. Thanks! this is the only way to solve these kind problems so keep goig, and never give up. There are many ways to get a new runescape accounts. The best choice is buying it in a formal site. Firstly, you have a lot of selection. Most site always have many accounts for you to choose. Some other sites even offer "account booking" service. It is another kind of powerleveling, if you are willing to wait, account booking is a good choice. Also, if you choose to buy account in a site, you will find that they are very professional. And most of the sits' service is very good. In my opinion, happy shopping is important. In many site, you can get the account you like as soon as you paid for it. I think everyone likes speedy delivery. ^^Beside, they have professional gamers, maybe they can give you some advise how to level account quickly. However, there are also some shortages when you buy runescape accounts in sites. Some sites sell accounts at a very high price. I suggest that you can search 3-4 sites and compare their price and service and then choose the best one. Another thing you should mention is that few sites cheat customers. You can check the credibility of a site before you buy products from it to avoid cheating. You should also notice the service of site. Online service respects a site's service quality. I have bought an account from a site which i don't want to mention the name here. I met the worst customer service i have ever been. At last, i didn't buy the account although i like it very much. Because i am not sure whether they will help me if I meet problems about this account in future. Then, how and where can we choose a desired account? You can search "buy runescape accounts" in google.com. Google will list many sites for you. such as www.myrsmoney.com, www.rs2happy.com, www.rs2seller.com...etc,You can compare these sites in the following aspects: speedy response, professional service, and reasonable price. If a site contains such quality, i believe you will be satisfied in buying there. I know a site which has many accounts and provides good customer service. It is very interesting when i get contact with this site. Four months ago, my friend asked me to play gamer with him at a weekend. When i logged in the game, i didn't find him. Then a stranger sent a message to me. This guy had the best equipment which i have dreamed for long time. You may already know he was my friend! He bought this account in accountrs.com. He was not very good at training account. But then he got an account far better than mine! He told me this site. I viewed the site immediately! The customer service operator asked my requirement and recommended 3 accounts for me. At last, i bought one of them. Lol, it was really a happy experience. I don't mind to share this secret with other friends. Now we all get desired accounts! How wonderful! I believe you can also get an unparalleled account soon! Shen Haining, vice director of the provincial culture department, said that the government would give some financial supports to those troupes trying to stage top works and create new productions. But the main policy is to let troupes survive in market competition. Both the Han and Chu operas are facing difficult times, according to Yu. As young people show no enthusiasm about them, they are short of performers as well as audience. On Tuesday night, Con Ed imposed a voltage reduction, or brown out, of up to 8 percent in parts of Brooklyn and Queens to allow workers to fix overheated cables supplying power to several neighborhoods. Still, authorities were taking precautions to prevent any disruptions to service. nary equipment, such as extra elevators or escalators, turning off pumps for ornamental fountains, limiting the cooling of buildings, and using emergency generators to offset some of the electricity they take from the power grid. PJM's power usage reached 136,398 megawatts on Tuesday, the highest since 2007, and was expected to climb even higher to about 137,800 MW Wednesday afternoon. PJM serves more than 51 million people in all or parts of Delaware, Illinois, Indiana, Kentucky, Maryland, Michigan, New Jersey, North Carolina, Ohio, Pennsylvania, Tennessee, Virginia, West Virginia and the District of Columbia. The new energy has started by the members of the supergrid.It is a must that the world will be looking for another alternative method to meet the ever-growing demand for energy and the anticipation of the diminishing fossil fuel supply.